Home Evans EMAD Calftone Bass Drum Head 18"
Evans EMAD Calftone Bass Drum Head 18"
$43.49 This may be in stock for quick delivery; please call! 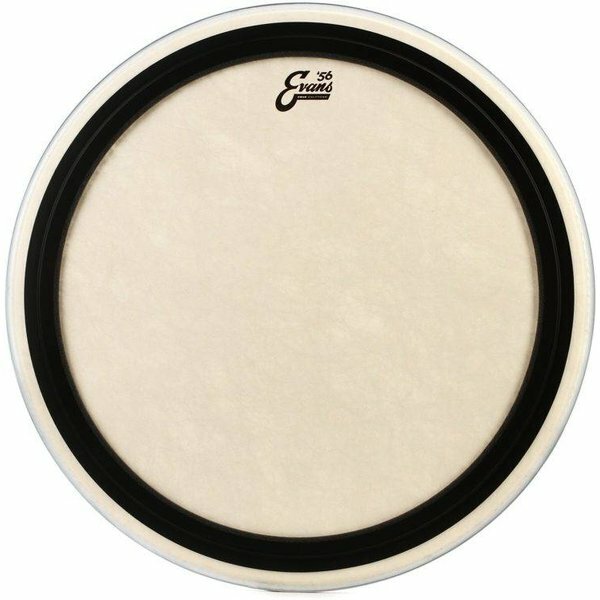 As a throwback to the year Evans was founded, Evans '56 is a new series of products geared towards drummers looking for a vintage look and sound. Making its debut in this new series is a line of Calftone drumheads-a synthetic alternative to traditional calfskin. These heads embody the calfskin look and sound but with the consistency, fit, and tuning range made standard with Level 360 Technology. Calftone is made using a 12mil Mylar base blended with unique materials to produce warm, full, and rich tones. These heads bring out the best of a vintage kit and evoke a classic appearance and sound from modern drums. This line will come in vintage-style Evans '56 Calftone packaging. Bass heads are available in sizes 16-26" and in three different versions-Calftone, EQ4 Calftone, and EMAD Calftone.